Not all banks are created equal. While all banks take in deposits and make loans the type of deposits and loans make a difference when it comes to the quality of the bank. In the banking world the ideal customer is a business customer. Business deposits are larger, business loans are larger, business customers are less needy and a bank can differentiate itself through customer service. While all banks aspire to business banking it shouldn't be a surprise that there are specific 'business banks'. Orange County Business Bank (OCBB) is one such bank located in Orange County, California. While researching the bank I found a newspaper article where the CEO explained why the bank was founded. From 1992 to 2000 the number of local Orange County banks declined from 42 to 9. At the same time there were over 100,000 businesses registered in the county alone. The bank's founders saw an opportunity to serve a unique market niche. The bank was formed in the depths of the market crisis in 2002, which is when they IPO'ed and raised $20m. The bank then went back to the market a second time and raised an additional $30m in 2004. With this bank the numbers tell the story. Here is a bank that grew from zero at their IPO to $249m in assets in 2009. The bank wasn't immune from the financial crisis when their portfolio took a hit in 2010. In 2010 the bank charged off 4.57% of their loans, a significant amount. Since then charge-offs and non-performing loans have declined. The bank's troubled loans never came close to causing problems for the bank because the bank has been significantly overcapitalized since their founding. Since the IPO the bank's Tier 1 capital has never dropped below 25% and recently has risen above 30%. The bank's extra capital is part of the reason their returns on equity is so low. With excess capital the bank has capacity to make additional loans or conduct an acquisition. In the most recent quarter the bank announced that assets and loans grew as well as net income. While excess capital give management options for the future it's also a thorn in the side of shareholders. Shareholders contributed $50m in initial capital to create the bank and then watched management sit on the cash for the last decade. The bank managed to survive the crisis due to the war chest but has since seen capital erode from crisis losses. It's no wonder that the stock is ignored and investors are frustrated. There are two things that make this bank attractive from an investment perspective. The first is their valuation. The bank is trading for $5.85 whereas book value stands at $8.59 per share. At current prices the bank is trading for 68% of book value. There are not many banks trading for less than 70% of book value at this point in the market cycle. For a bank to be trading around 2/3 of book value either signifies that the bank has serious problems, or it's seriously ignored. The second attractive aspect is related to the bank's troubled loans. Most of the time a bank charges off bad loans and the loss is forgotten. The bankers at Orange County Business bank have continued to pursue loan recovery even after their loans were written off. In their second quarter press release the bank included a statement that was bolded announcing that they'd made a loan recovery in the amount of $2m plus interest. The bank passed through the recovery in the recent quarter reporting $.46 per share in earnings and an increase to book value of $3.5m. While the record earnings were a one-off event the book value increase was not. The bank reported that they are continuing to aggressively pursue loans that have been charged off, which means it's possible there could be some potential future recoveries. In the end this is a small bank trading at a sizable discount to book value that continues to be profitable. If anyone is building a basket of cheap banks this is one to include. I truly do not understand why you would recommend a company where they have destroyed value over the entire existence. Am I reading it wrong that their Average Equity in 2005 was 45.4 Million and it was 37.7 Million in 2013? Did they pay out money in dividends or share buybacks? If not, they did absolutely terrible with returns on reinvested capital. You could have done better by putting 45 Million in your mattress in 2005 than invest with this company. 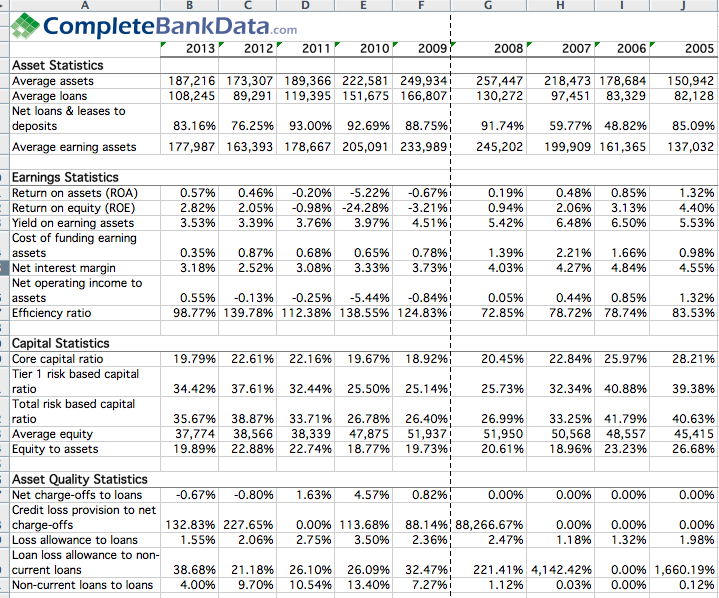 This is the 2nd California bank with capital ratios of >25%, AUNB. AUNB is at 0.82 P/B with better profitability and asset trends (although also losing deposits recently). Fighting deposit loss and low ROE make it tough to get decent returns even in P/B is below 1 because it becomes a race to P/B >= 1. Does it concern you that OCBB is having difficulty finding assets during the crisis or with such a large under-banked small business community?